When one transmits a television signals using frequency modulation, it is necessary, before feeding the modulator itself, to carry out a small operation called pre-emphasis. Pre-emphasis consists of changing the levels, in the radio channel, of the higher modulation frequencies relative to the lower frequencies. The exactly opposite operation - de-emphasis - must be carried out at the receiver. The pre-emphasis makes it possible to minimize the visible impairments when the received signal is noisy. The curve of pre-emphasis used in television was the subject many studies before standardization. Standardization is necessary so that the manufacturers of transmitters and receivers use equal but opposite curves, if the overall results of the transmission system is to be a flat frequency response. How the pre-emphasis of the signal is carried out? 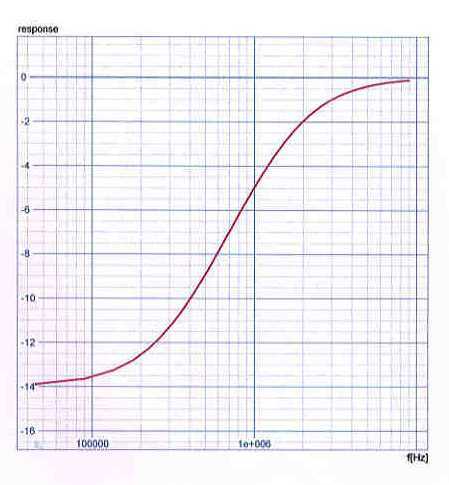 What is the response curve of the quadripole filter? The question can appear academic since the answer is given in the description of the standard. However, it can be interesting to analyze this circuit to appreciate the consequences of a value change of some components. After all not everyone has a 9.54uH inductor in his junkbox, or 1695 pF capacitor. So what does happen if standard value components are used, for example; 1800 pF capacitor, 10 µH inductor, and a 18 ohm resistor? The curve shows that the lower frequencies are attenuated by 14 dB, whereas the attenuation of the high frequencies is nil. Notice that the slope of the curve is mostly between 100 kHz and 3 MHz. As a fun exercise, you can now change the part values and compare the results when using standard components. Not to worry, the levels do not vary of more than 0.5 dB! You will also be able to observe the phase variation and group delay of each model of the filter. Translation with the friendly help of Bob Bachus.